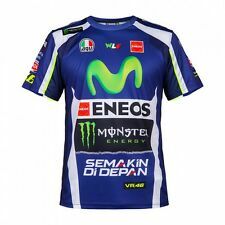 Valentino Rossi Yamaha Official Team Shirt Mens Size XL V46 The Doctor. Condition is New with tags. Shipped with USPS First Class Package. Valentino Dress Shirt White 15 32/33 Size Men’s Made In Italy. Condition is Pre-owned. Shipped with USPS Priority Mail. 100% authentic. Final sale. overall length between 25.5”-26”. Valentino Men’s Dress Shirt White size 16. Condition is Pre-owned but in good condition. Refer to pictures. It is a subtle lilac and white stripes pattern. It is a beautiful high-quality shirt that my husband no longer fits in. The shirt features 100% Egyptian Combed Cotton. Chest: 23" (from under arm to under arm). Hi, I am selling a Valentino Beachwear Orange t-shirt, size men’s XL. It is made in Italy and in very good condition; no stains hole or rips. The shirt measures about 31” down the front x about 23” across the chest, and about 16” in short sleeve length. All sales are final and no returns will be accepted. Model: ROCKSTUD UNTITLED #16. Item is in essentially new condition. Composition: COTTON. Grade: 9.9 out of 10. I WILL RESPOND AS QUICKLY AS I'M ABLE. Men’s Valentino Camouflage Cotton T-Shirt Size XL 100% Authentic Brand New with Tags Feel Free To Contact Me With Any Inquiries Serious Bidders/Buyers Only Please! Thank You HowToLuxLLC -High End Consignment Shop Specializing in Rare and Highly Sought After Fashion Items. 100% GENUINE ITEM. 100% COTTON. MADE IN ITALY. LUXURIOUS QUALITY SHIRT IN FAMOUS CAMOUFLAGE BUTTERFLY PRINT, CREW NECK, SHORT SLEEVES, RUTHENIUM ROCKSTUD EMBROIDERED ON THE BACK. 100% COTTON. CHEST 40-42", LENGTH 28". We can't be held responsible if item does not fit. Valentino The Next Beginning Cotton T-Shirt BLUE Mens Apparel Shirts Valentino T-shirt created in collaboration with punk legend Jamie Reid. Ransom-style "It Seemed To Be the End / Until the Next Beginning" print. Crew neckline. Short sleeves. Pullover style. Regular fit. Cotton. Made in Italy. Guaranteed Authentic Valentino Mens T Shirt Large. Condition is New with tags. Shipped with USPS First Class Package. Valentino shirt men MSRP $1000. Condition is Pre-owned. Shipped with USPS Priority Mail. This is a great shirt! It's a really great summertime t shirt! Perfect for this upcoming summer. Grab it now and get a great new addition to your closet! Valentino CAMOUFLAGE Men's Cotton T Shirt. M.
Signature gold stud under collar. Crew neck, short sleeves. Color: Multi. Style: MV0MG08K4A5. Overall length: 27". Shoulder: 19". Sleeves: N/A. NWT Men’s Valentino T-Shirt Size S GREY ROCKSTUD 100% AUTHENTIC. Condition is New with tags. Shipped with USPS First Class Package. 100 % Cotton ( thicker than regular shirt ). It is so Unique and Gorgeous Shirt. length 26~ 30 " ( Shoulder to hem ). size (40, 15 1/2. ). Total Length: 27". Sleeve Length: 8". Shoulder to Shoulder: 20". XXXS 000 0 28 32 28 1,3 0 26. XXL 18-20 24 50-52 54-56 48 23 24 50. Condition: This item is in very good condition. Displays minor signs of wear that may include slight snags, fuzziness, and/or interior blemishes. MADE IN ITALY. LUXURIOUS QUALITY SHIRT IN FAMOUS CAMO BUTTERFLY PRINT, CREW NECK, SHORT SLEEVES, RUTHENIUM ROCKSTUD EMBROIDERED ON THE BACK. 100% COTTON. CHEST 36-38", LENGTH 27". We can't be held responsible if item does not fit. Mens Valentino Shirt Sz M. Condition is Pre-owned. Shipped with USPS First Class Package. In great condition. Sz 15.5 or medium. No flaws. 100% authentic. New with tag 100% Authentic Mens Size L Valentino Garavani Military Rockstud Camo black and grey T-Shirt. Men's Valentino Camo & Star-Print T-Shirt, Black Sz L "New with Tags"
Brand new with tags. Never worn. Currently retails on neimanmarcus for $695. Buy now this won't last. This men's Valentino shirt is in great condition. Valentino is a brand that is mainly known for their very high quality men's and women's styles. If you have any questions about this item, please don't hesitate to contact me. Authentic Valentino shirt European size xxl but fits like a US large if you need measurements i can take them. Item is in good pre owned condition as seen in the pictures. Guaranteed authenticity. Insured shipping with signature required. 100% COTTON. ITS 100% GENUINE.